Wow, it's been a while since I've updated and it's REALLY been a while since I have had a project picked up for publication! 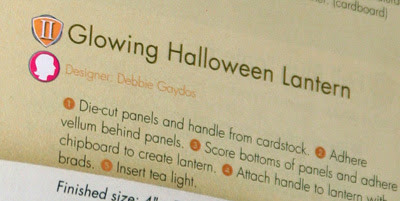 But recently I had a fun little Halloween decor project requested by Paper Crafts for their special issue, Handmade Home Decor, and the issue is now out! On top of that, I am one of the new designers featured on the Paper Crafts Connection blog today! HOW FUN IS THAT!??! I received my issue a few days ago, and there I am, right on page 69!! OK, now on to a new card! This card was for a special family friend who just celebrated her 14th birthday! I remember when this sweet young lady was born... it's so hard to believe that she is going to be in high school next year! I wanted to make the card bright and colorful, so my basic color scheme was Hawaiian Shores and Raspberry Fizz. I die-cut the Fabulous Frames frame from Aqua Mist and stamped with Hawaiian Shores, and backed it with white, with the sentiment stamped from Stylish Sentiments: Birthday. I stamped and hand-cut the little "flag" from Birthday Tags 2012, and added some bakers twine and a Hawaiian Shores button. The whole frame panel is popped up on foam tape and adhered to the base, over a piece of Echo Park patterned paper and a Raspberry Fizz mat. Congrats on your publication, and I love that sweet and bright birthday card. Alleluia, He is risen! Happy Easter! a Birds & Blooms "Hello There"